Hardback. 1st UK Edn. A Pulitzer Prize winner. In Istanbul, at time of publication, morphine base sold for $350 a kilo, in Munich for $700 a kilo, in Marseille for $1,100. Converted to heroin, a kilo brought $240,000 on the streets of America. The first journalistic investigation to trace heroin traffic from Turkey to France to its ultimate customer - the young American addict. Turkey - where the poppy ban was meaningless. Where heroin spelled money and power for the farmers who extracted gum from the flower, the middlemen who turned this to morphine base, and the profiteers, the 'patrons' who arranged the first stages of smuggling the raw material through Eastern Europe, Austria, Germany to France...The world's laboratory for heroin production, where chemists clustered round Marseilles were paid huge sums for converting base into heroin. Here underworld racketeers maintained powerfully close ties with big names in the French government, and where too thorough an investigation into the nature of this relationship led to harassment by the French secret service...America, the heroin capital of the world, where the problem was so massive that law enforcement agencies were totally inadequate to break through the tight network of heroin factories, the place where the heroin was diluted and parcelled. 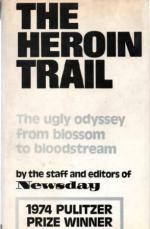 From here it was passed to the pusher, and from him to the client who paid for the whole billion-dollar industry with addiction, wrecked youth, violence and death. Illus., Epilogue and Index. 322pp. 8vo. h/back. Vg+ in sl. sunned Vg. dw.